I don't know about where you live, but here in Nashville, it's still winter. STILL. WINTER. I don't remember ever having snow this late in the season. We have a few inches of snow at the moment, which is really quite pretty because we don't get much snow here (and often get no snow during the winter), but I'm feeling ready for more sun and warmer temps. In the meantime, comfort food is just the thing to get me through the end of winter. When being on a restricted diet, I think the importance of "soul food"- foods that taste and feel comforting and satisfying as well as nourishing (to both body and soul)- is hugely helpful for maintaining an attitude of positivity toward food. I try to consciously cultivate good feelings toward my food, rather than focusing on what I don't tolerate or can't eat at the moment. How we frame things is not to be underestimated in the scheme of health, healing, and happiness. 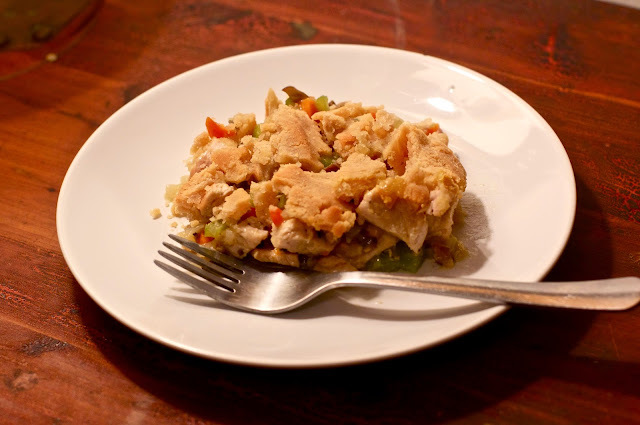 I'm excited to share this recipe for chicken pot pie. It's not complicated and everyone I've served it to loved it and asked for the recipe, so I feel I can safely say it's a winner. The crust is yummy and flaky. I always joke that I'm a sucker for anything involving a pie crust and it's true. So, this recipe makes me very happy. The hubby and I often make it on Sunday evenings before we curl up and watch all our PBS shows and it's become a cozy weekly ritual. The crust is an adaptation of this fabulous AIP crust from The Paleo Partridge. Add carrots, celery, onions, and mushrooms to a large pan with the cooking fat of your choice and saute on low-medium heat until starting to soften. Add the rest of the ingredients, whisking the arrowroot into the coconut before adding to the pan and continue cooking over low until the sauce thickens up. Add to a 9 inch round or 11 inch oval casserole dish. Combine the dry ingredients well and whisk in the melted shortening. It will have a liquid consistency at this point. Add the water and mix well (it will magically thicken and form a soft, but crumbly dough). Press out small pieces of dough in your hands and piece them together on top of the filling. It will be messy and rustic looking which works nicely for pot pie. Bake at 330º for 28-30 min. or until the crust is golden brown. 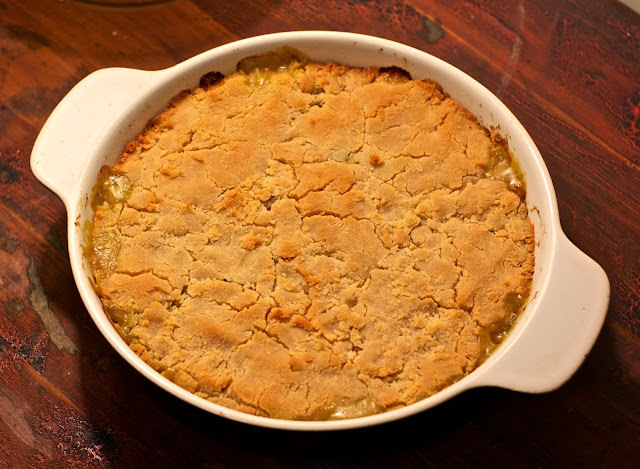 I highlighted this recipe as one of my favorites at this week's AIP Recipe Roundtable. Thanks so much for joining us! My whole family loved this dish, which I made for dinner tonight. I made a few modifications. I added 1 cup of bone broth after I put the coconut milk in and let it simmer down a bit, and I used coconut oil instead of palm shortening in the crust. Oh, and I was out of carrots, so I just added more of the other veggies. Sooo good! And the crust was really fun; one second I'm whisking liquid and the next second I have a big ball of dough in the whisk. It was like a science experiment. Thank you for a divine (and easy) recipe. It's a keeper. I'm so glad you liked it! I sometimes add some bone broth, too! I think the filling ingredients are very flexible. What's the purpose of arrowroot? It's a starchy flour and a thickening/binding agent. For example, if you tried to make the crust with just coconut flour, it would be a crumbly mess. In other AIP recipes, it's often the main flour. You can use it in place of corn starch to thicken sauces. Hi! Do you think this recipe would freeze well? I haven't tried freezing it but my guess would be that it would freeze fine. I never have any left over to freeze! I make an almond crust for my clients' pot pie, and decided to search for an AIP crust for myself. This looks outstanding. I like your addition of arrowroot to help bind stubborn-ol' coconut flour to the fat. Trying it tonight, thank you for the recipe! I just wanted to say thank you so much for this recipe! I actually haven't even made this exact recipe *yet*, but I've used the crust and it's DELICIOUS. I used this crust over a breakfast casserole of sausage, apples and onions. Subbed cinnamon for the garlic - and it was "buttery" perfection. The ultimate comfort food! My non-AIP husband couldn't get enough of it - he couldn't believe it was an "allowed" food (aka: won't make me sick). I know I'll be trying this in different recipes - savory and sweet (fruit cobbler, anyone?!). might want to look into the use of palm oil. known to be destroying various species and the environment. Yes, I'm aware of the issues surrounding palm oil, however, there are sustainable brands available, like Spectrum Organics, which is the one I use. It's certified by the Roundtable On Sustainable Palm Oil (RSPO).